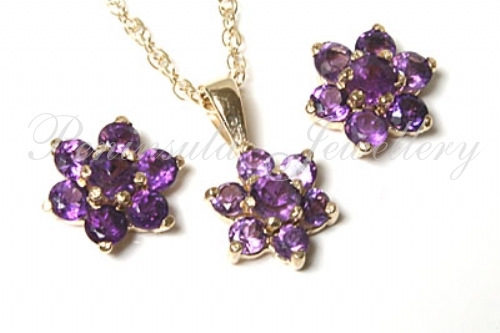 9ct Gold Gem Set Pendants > 9ct Gold Amethyst cluster stud earrings and Pendant set with 18 inch chain. Earrings; Classic studs featuring one 3mm round cut Amethyst in the centre, surrounded by six 2mm Amethyst gemstones. Complete with 9ct gold fittings. Dimensions: 8mm diameter. Stamped 375. Pendant; Classic Pendant featuring one 2.5mm round cut Amethyst in the centre, surrounded by six 1.5mm gemstones set in 9ct gold. Dimensions: 7mm diameter cluster, 13mm long including fixed bail. Made in England. Supplied in a luxury gift box.